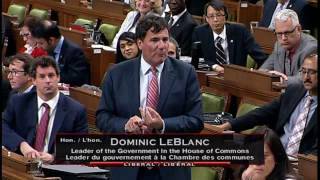 Sun, Jun 19: Liberal MP Dominic LeBlanc's father Romeo was fisheries and oceans minister under Pierre Trudeau. Now LeBlanc has the same job under the another Prime Minister Trudeau. Added July 25, 2016 from Dominic LeBlanc. Added August 19, 2016 from Dominic LeBlanc.